This is important because (a) it shows evidence for the "slow" mutation rate in a species related to humans, (b) it shows that chimp and human mutation rates are equal and so using the human mutation rate in studies of divergence with chimps is justified, and (c) it is driven differently by males/females than in humans. Germline mutation determines rates of molecular evolution, genetic diversity, and fitness load. In humans, the average point mutation rate is 1.2 × 10−8 per base pair per generation, with every additional year of father’s age contributing two mutations across the genome and males contributing three to four times as many mutations as females. 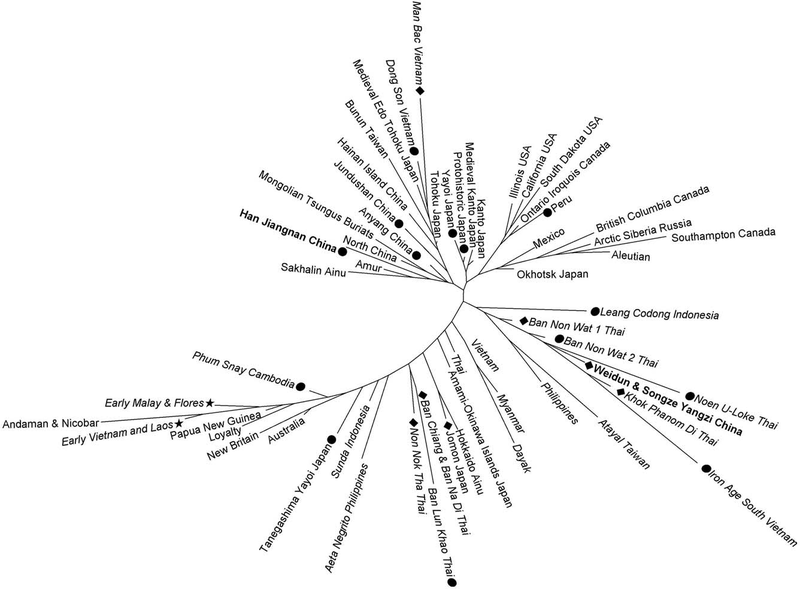 To assess whether such patterns are shared with our closest living relatives, we sequenced the genomes of a nine-member pedigree of Western chimpanzees, Pan troglodytes verus. Our results indicate a mutation rate of 1.2 × 10−8 per base pair per generation, but a male contribution seven to eight times that of females and a paternal age effect of three mutations per year of father’s age. Thus, mutation rates and patterns differ between closely related species. The paper includes a craniometric dataset on 10 variables in the supplementary material. Skin color is one of the most visible and important phenotypes of modern humans. Melanocyte-stimulating hormone and its receptor played an important role in regulating skin color. 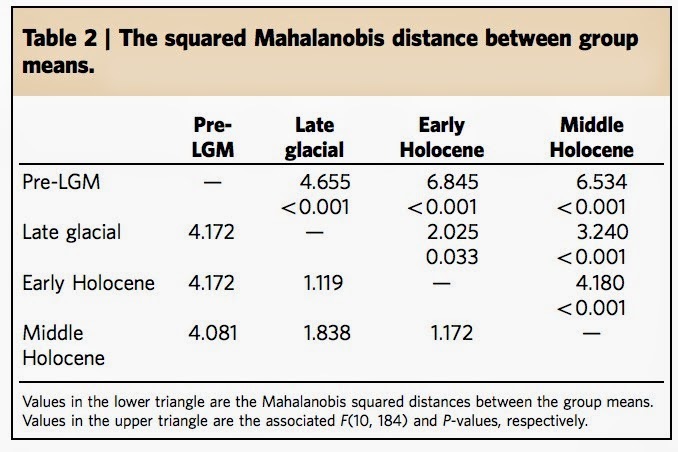 In this paper, we present evidence of Neanderthal introgression encompassing the melanocyte-stimulating hormone receptor gene MC1R. 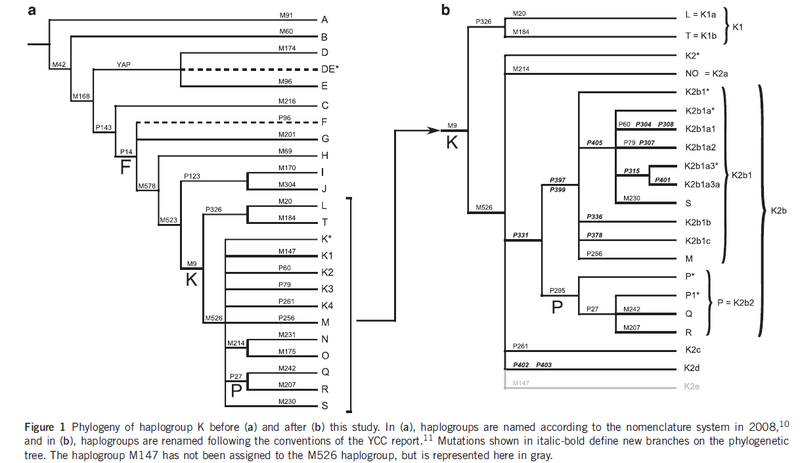 The haplotypes from Neanderthal introgression diverged with the Altai Neanderthal 103.3 KYA, which postdates the anatomically modern human – Neanderthal divergence. We further discovered that all of the putative Neanderthal introgressive haplotypes carry the Val92Met variant, a loss-of-function variant in MC1R that is associated with multiple dermatological traits including skin color and photoaging. Frequency of this Neanderthal introgression is low in Europeans (~5%), moderate in continental East Asians (~30%), and high in Taiwanese aborigines (60-70%). Since the putative Neanderthal introgressive haplotypes carry a loss-of-function variant that could alter the function of MC1R and is associated with multiple traits related to skin color, we speculate that the Neanderthal introgression may have played an important role in the local adaptation of Eurasians to sunlight intensity. An interesting new (open access) paper in PNAS includes some new data from Crete, the Dodecanese, Cappadocia, and several other Greek (and a few non-Greek) populations, and proposes that the Neolithic followed an island-hopping migration into Europe. This is a study on modern populations that nicely complements the recent ancient mtDNA paper from PPNB which found an affinity to Neolithic Near Eastern populations among the modern inhabitants of Cyprus and Crete. It is hard to imagine that there were ever any major impediments to gene flow between Anatolia and the Balkans as the Aegean islands and Hellespont are not formidable barriers to any culture with even rudimentary technology. Hopefully in the future it will become possible to look at ancient DNA from Greece and Anatolia and directly determine how the transfer of the Neolithic package into Europe took place and how much of the ancestry of modern populations stems from the Neolithic inhabitants vs. more recent shuffling of genes in either direction. The authors also computed f3-statistics to see if populations were admixed, but found no significant evidence for it. If, for example, Dodecanesians were intermediate between mainland Greece and Anatolia they might have a negative f3(Dodecanesian; Cappadocia, Peloponnese) statistic. A negative statistic proves admixture but a positive one does not disprove it, but, in any case, there is no signal of admixture here so the results are compatible with the authors' model and probably incompatible with a recent admixture that would leave a significant negative signal (i.e., Dodecanesians/Cretans would have intermediate allele frequencies between Cappadocians and mainland Greeks). The Neolithic populations, which colonized Europe approximately 9,000 y ago, presumably migrated from Near East to Anatolia and from there to Central Europe through Thrace and the Balkans. An alternative route would have been island hopping across the Southern European coast. To test this hypothesis, we analyzed genome-wide DNA polymorphisms on populations bordering the Mediterranean coast and from Anatolia and mainland Europe. 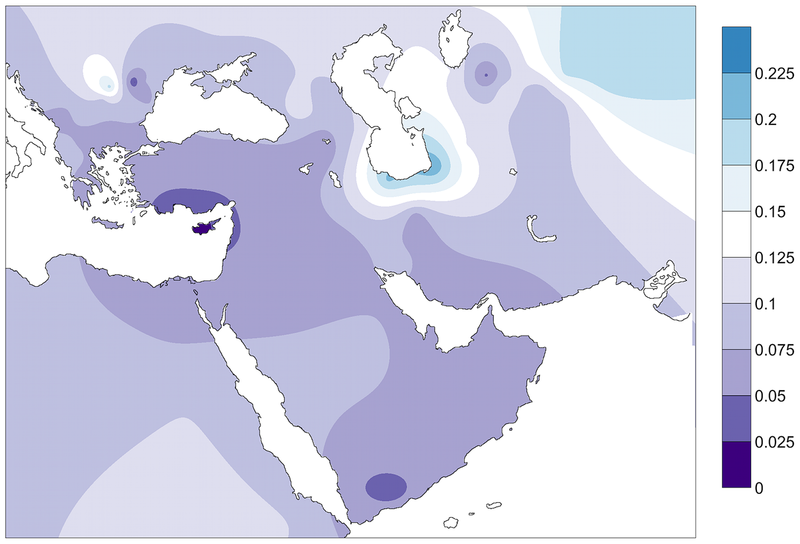 We observe a striking structure correlating genes with geography around the Mediterranean Sea with characteristic east to west clines of gene flow. Using population network analysis, we also find that the gene flow from Anatolia to Europe was through Dodecanese, Crete, and the Southern European coast, compatible with the hypothesis that a maritime coastal route was mainly used for the migration of Neolithic farmers to Europe. The whole program appears to be online, so feel free to point to any noteworthy abstracts in the comments. Figure on the left shows Fst values between the ancient PPNB population and modern populations. The genetic impact associated to the Neolithic spread in Europe has been widely debated over the last 20 years. 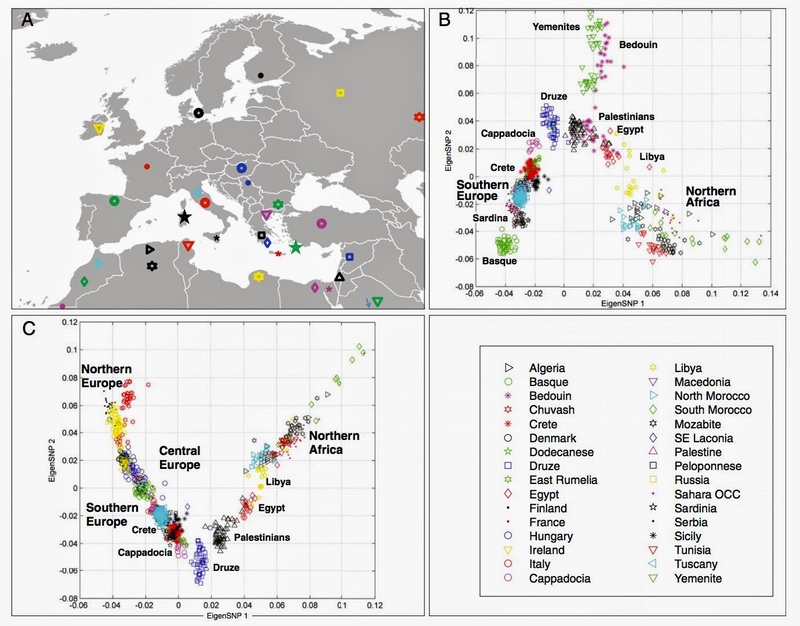 Within this context, ancient DNA studies have provided a more reliable picture by directly analyzing the protagonist populations at different regions in Europe. However, the lack of available data from the original Near Eastern farmers has limited the achieved conclusions, preventing the formulation of continental models of Neolithic expansion. Here we address this issue by presenting mitochondrial DNA data of the original Near-Eastern Neolithic communities with the aim of providing the adequate background for the interpretation of Neolithic genetic data from European samples. Sixty-three skeletons from the Pre Pottery Neolithic B (PPNB) sites of Tell Halula, Tell Ramad and Dja'de El Mughara dating between 8,700–6,600 cal. B.C. were analyzed, and 15 validated mitochondrial DNA profiles were recovered. In order to estimate the demographic contribution of the first farmers to both Central European and Western Mediterranean Neolithic cultures, haplotype and haplogroup diversities in the PPNB sample were compared using phylogeographic and population genetic analyses to available ancient DNA data from human remains belonging to the Linearbandkeramik-Alföldi Vonaldiszes Kerámia and Cardial/Epicardial cultures. We also searched for possible signatures of the original Neolithic expansion over the modern Near Eastern and South European genetic pools, and tried to infer possible routes of expansion by comparing the obtained results to a database of 60 modern populations from both regions. Comparisons performed among the 3 ancient datasets allowed us to identify K and N-derived mitochondrial DNA haplogroups as potential markers of the Neolithic expansion, whose genetic signature would have reached both the Iberian coasts and the Central European plain. Moreover, the observed genetic affinities between the PPNB samples and the modern populations of Cyprus and Crete seem to suggest that the Neolithic was first introduced into Europe through pioneer seafaring colonization. Catherine A Guenther et al. Hair color differences are among the most obvious examples of phenotypic variation in humans. Although genome-wide association studies (GWAS) have implicated multiple loci in human pigment variation, the causative base-pair changes are still largely unknown1. Here we dissect a regulatory region of the KITLG gene (encoding KIT ligand) that is significantly associated with common blond hair color in northern Europeans2. Functional tests demonstrate that the region contains a regulatory enhancer that drives expression in developing hair follicles. This enhancer contains a common SNP (rs12821256) that alters a binding site for the lymphoid enhancer-binding factor 1 (LEF1) transcription factor, reducing LEF1 responsiveness and enhancer activity in cultured human keratinocytes. 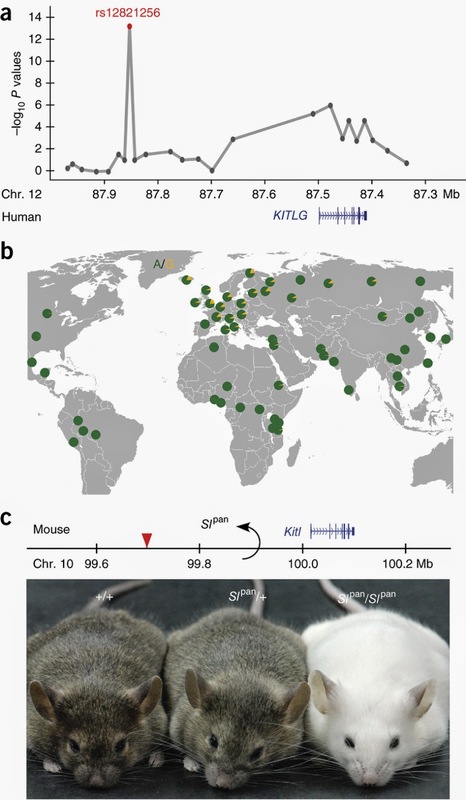 Mice carrying ancestral or derived variants of the human KITLG enhancer exhibit significant differences in hair pigmentation, confirming that altered regulation of an essential growth factor contributes to the classic blond hair phenotype found in northern Europeans.